Sorry about the delay in getting the answer to you! 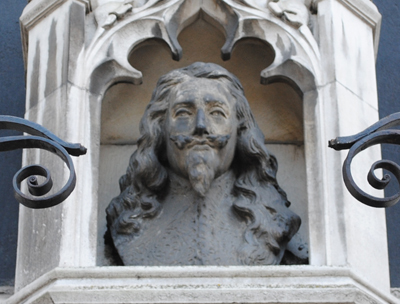 But yes, as Baldwin and Jennifer both answered, this bust of King Charles I does indeed sit on the wall of St Margaret’s Church opposite the Houses of Parliament, above a blocked doorway. There is a story that the statue of Oliver Cromwell which stands opposite, outside Westminster Hall, has his eyes deliberately averted from the King (after all, he did help him lose his head). But Cromwell statue, by Hamo Thornycroft, was placed in position well before the bust – it’s placement dates from the turn of the 19th century while the bust (one of a pair) wasn’t placed on the church until 1956 (a gift of The Society of King Charles the Martyr which annually commemorates the king’s death). Still, it’s a fitting placement.